Doorways. The subject of this weeks Focus on Life series with Studio Sublime. I struggled until realizing that one of my most frequently used doorways is the door to creativity. For me, the threshold is crossed when immersing myself in an inspiring book, periodical or my art journal. And, of course, the ultimate threshold is actually diving in, grabbing a brush and beginning the journey. That's my doorway. What's yours? I love this post. I just love how people think outside of the box when it comes to these challenges, it makes me think and see things in such a different way! I like your take on this prompt and not literally using a door, but yet a door way of the mind into your talent. I love your concept of doorways!!! Good job!! Great. 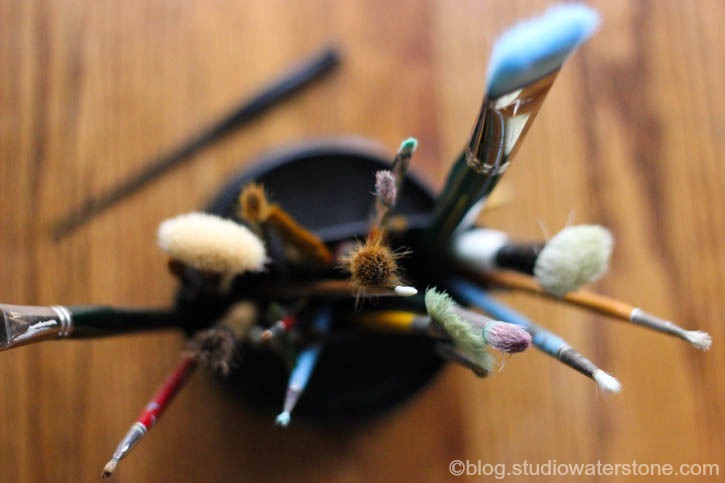 Your portal to creativity starts with the tools. Beautiful picture! I love the way you did it. Great post Lori, and awesome photos! You are inspiring! What an obvious and beautiful reminder that we all have that doorway to our creativity. Yours is always overflowing with loveliness. I like your take on doorways, it was a prompt to really make you us think . Wow - I love your take on this prompt! I did not participate this week - I was just too stumped! You have opened my eyes to a new way of thinking...thank you! Wonderful concept.. I love to read and yes reading really is a doorway into another world! Exactly...doorways to creativity are everywhere...thanks for the reminder of that! Great post! I love your journey's. Lori, your door is one of my favorites! :-) To get lost through the doorway in a book is a favorite of mine and to step through the doorway as I create and learn leads me 'home', to my soul. I too see books as doorways. Knowledge moves us forward in our lives and books are a great doorway to knowledge. Wonderful post Lori! Love the photo of the books and the brushes! I just love this post. I wavered between the door to my studio or my front door. I finally decided that my front door looked cooler. 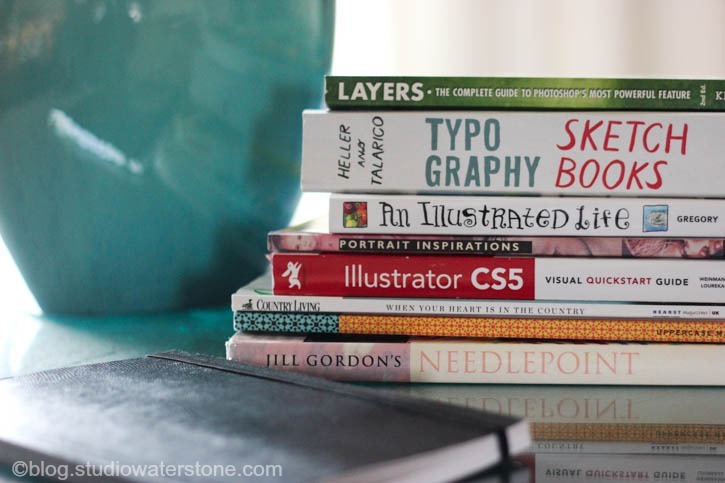 Love the glimpse the stack of books gave us into your passions. From needlepoint to CS5 and Country Living, all connected by your creative spirit! Those are great photos and I love your interpretation. Creativity is a great door to enter. Great job on thinking outside the box! Yes yes, yes! Books are doorways to go annnnnnywhere that you want! Creative and inspiring point of view! Lori, this is such a very creative interpretation of the prompt! Beautifully photographed! Lori, your post for Knock knock is so ceative (like you) I just love your concept. Beautifully done.